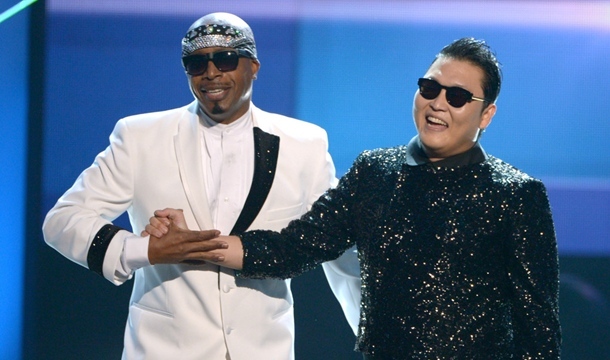 So, what does Psy‘s appearance with MC Hammer and the 2012 American Music Awards mean? On one hand, it signifies a different kind of engagement than we have seen between Psy and African Americans in the United States. While cameras have captured Psy with any and everyone, including Madonna, Justin Beiber and Jon Bon Jovi, sites like Black Kpop Fans have chronicled his appearances with African Americans, such as Kanye West, Kevin Hart and will.i.am, providing somewhat of a gauge for his engagement with black America. This is to be expected, given the impact that African American R&B/soul and hip hop have on Hallyu (Korean wave). Psy echoed this point in a recent interview about how the MC Hammer/Psy collaboration took place: “Psy admits that he’s been a lifelong fan of Hammer so it wasn’t hard for him to go Hammer-time at the AMAs. He tells CNN, ‘Honestly, I practiced his move[s] 20 years ago, so I’ve done that for 20 years.’ So, his appearance with MC Hammer at the AMAs functioned as a moment where nostalgia meets the present, both for the audience and for Psy himself. The joint appearance also strikes me as a profoundly mainstream American cultural moment. Psy has been popping up all over the place, as has the dance for Gangnam Style. Some may take issue with MC Hammer’s assertions about the ultimate impact of Psy: “He’s shifted the planet. He’s got the whole world dancing. And it’s a rarity in this world. Only four people made that happen in history — James Brown, Michael Jackson, yours truly and Psy.” However, he has achieved a certain level of global recognition. Whether this paves the way for other K-pop acts remains to be seen. My point, though, is that Psy is resonating with a mainstream sensibility. This collaboration was something that many could identify with. Who doesn’t remember Hammer pants? At the same time, however, some may be wondering where are Psy’s appearances in venues where he would engage less high-profile black celebrities and have more conversations about the impact of black culture on K-pop. Maybe that’s asking too much, which is why I may have to be content with seeing Psy’s journey in America as the mainstream cultural moment that it is, as opposed to the cross-cultural moment it could be. By now, your long-suffering K-pop fan in the United States may be fervently wishing for this moment to pass, but is grateful for the exposure of K-pop to a larger audience. But with that exposure comes a different kind of response, one less positive and more revealing of the multiple cultural forces at play in Psy’s popularity. While the audience reveled in this Afro-Asian moment at the AMAs, others were sending racist tweets, insisting that the American Music Awards had no place for a Korean pop star. None. Not at all. I can’t even quote them because they are so heinous, but you can see them at Public Shaming (scroll down). What is interesting about the tweets is that they focus on Psy’s “foreigness,” even as he is performing with one of the most recognizable icons of American pop music. As I suggested with my previous piece on Psy, his engagement with American culture is with ALL of American culture: that part that has its arms wide open because it has a cosmopolitan sensibility, and that part that don’t want any part of anything it deems “foreign.” As Psy continues his journey, I would like to see him step outside of the mainstream and talk to some other kinds of folk. Seeing him with MC Hammer may give others the idea that Psy represents much more than the latest trend.